Have you used this Australian History resource? Tell us what you think. OUR SUNBURNT COUNTRY was first published in 1964 and has been used widely for teaching primary students about Australian history. Since then it has become a popular living book for teaching Australian history in Australian homeschooling circles. It has now been republished by Downunder Literature, revised and updated to 2008. Our Sunburnt Country: An illustrated history of Australia tells the story of Australia's heritage, from Aboriginal settlement until the present. This work does not set out to be a detailed date and fact dissection of all that has happened. Instead it offers the reader a smooth-flowing piece of good literature that captures the historical events that have shaped a nation. The generous, delicate illustrations by Molly Johnson transform this text into a delightful work of art. 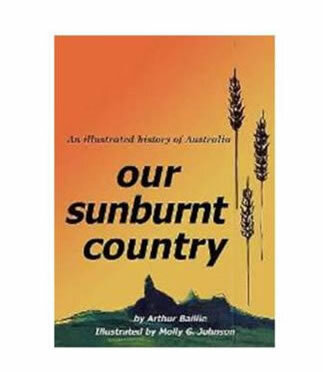 I first became aware of Our Sunburnt Country about five years ago when I was looking for an Australian history book to read aloud with my two oldest children, then aged 6 and 8. One of my friends recommended it and handed me her copy. She said it was very popular amongst homeschoolers as an excellent narrative style account of our history. So the kids and I sat on the couch and learned together our Australian history. The children loved the exciting stories and enjoyed the illustrations. My goal was to read one chapter per sitting but often I was begged for another chapter or two. I didn't mind at all; it was a good read, and I was sounding quite knowledgeable at dinner parties. When I was asked by others parents what I would recommend for teaching Australian history, I would unequivocally recommend Our Sunburnt Country, with the additional apology that it was out of print and they would have to hunt around and find one secondhand. I was so excited when Arthur Baillie agreed to allow us at Downunder Literature to republish Our Sunburnt Country. I was even more excited when I read through his updated and revised version. Arthur is still passionate about Australian history and has been able to thoughtfully update his original version with added information that was not publicly known and new historic events that have occurred since 1964. This book is an easy read alone (age 10 and up) or read aloud (age 6 and up). It has 144 pages with colour illustrations on every page.